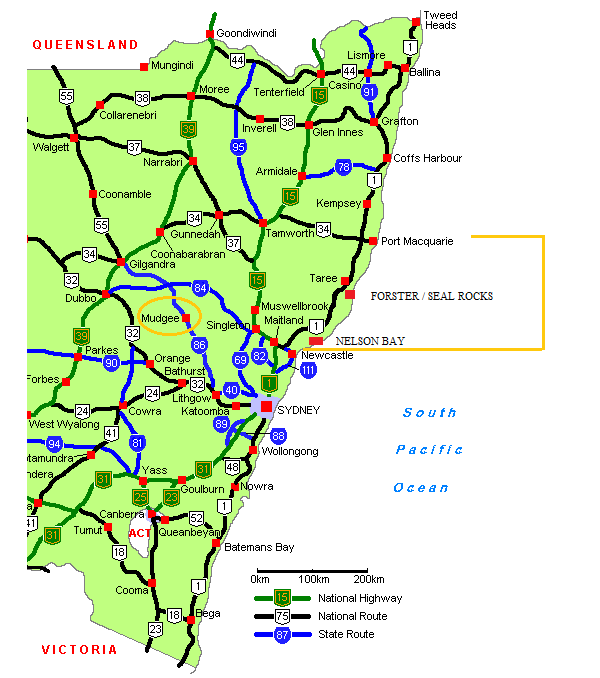 Below: Road Map - Mudgee to the targeted dive regions. 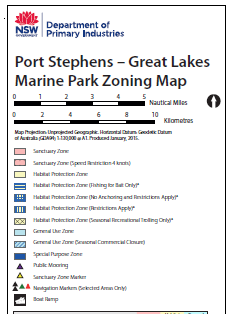 Located to the north of the Little Beach boat ramp, enter the site only in the cleared entry/ exit area. Boulders and sea urchins dominate the shallow area giving way to sponge gardens from about ten metres as you swim down the hill towards the north. The fish life in shallow water is extensive with big schools of luderick, bream and mullet swirling around in the shallow water. They are most active when high tide is late in the afternoon as the resident dolphin wait just out of sight of the diver. 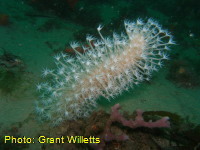 The most prolific sponge garden and the most intense fish life is due north of the entry area in about twenty metres and at eighteen metres due west of the entry. Interesting ledges from five metres are an ideal safety stop area. A safety stop is generally recommended at Halifax as it is more than likely that you would have descended past 18 m. Halifax is also a very good location for a night dive - but remember that you must dive it on the high slack tide. WARNING! This dive must be done on a SLACK tide as the currents here are VERY STRONG! 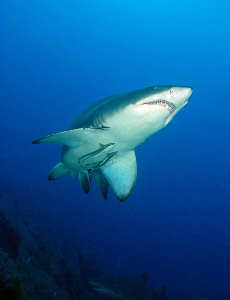 It is always recommended to dive here on the high slack tide as it produces the best visibility. It can also be dived on the low slack tide but the visibility is generally very poor. Another safety point, if you need to head for the surface for some reason, please make sure you swim in close to the shore as boats frequently cruise above this dive site. Ideally, you should have an SMB (Surface Marker Buoy) and deploy it from 5m depth. If you surface from deep water there is a very good chance you could become struck by a boat. If you must surface try and head into shore before hand! 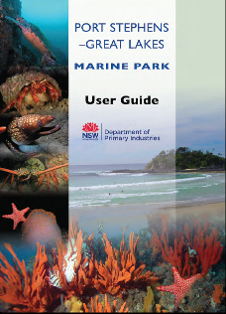 Click on the cover pic to download the User Guide. Located west of Little Beach this a prime training site with flat sandy areas and a prolific sponge garden from twelve metres. Large schools of bream, tarwhine and mullet are on the lookout for food at the entrance and huge flathead can be found in the shallow sea grass. 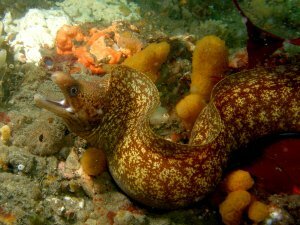 Further down, prolific nudibranchs, decorator crabs, pipefish and seahorse hide among the sponges and schools of baitfish, pineapple fish, bream, wrasse, pike as well as wobbegong sharks abound. A series of ledges provide protection for all sorts of small species. While the site is normally dived on high tide a drift dive from Fly to the fisherman's co-op is available for the more experienced. As you have to dive on the slack high tide you will generally find that are other divers in the car park gearing up, particularly on weekends. During the Christmas and Easter holidays, turn up VERY early to get a car park! There is a well defined access path to a set of concrete steps at the water's edge, this is the usual starting point. After entering the water and snorkelling out to where the water starts to deepen (around 4-5 metres), descend and head to your left (north-west) and a few minutes later (about 30 metres) you will come across the first of 2 ledges that run in parallel with the shore. You can follow these ledges to the left for quite some time and if you look carefully you may find the school of pineapple fish that are known to frequent this area. The school of pineapple fish can be found near the ledge where the plaque and garden gnomes are located! 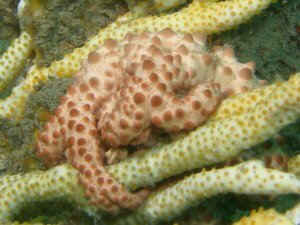 There is good sponge life right along this area. After following these ledges for some time, you can head out into the deeper water where the larger sponge gardens are. Out in the deeper water (17-22 m) there are prolific sponge gardens and the colours are amazing. There is a very large old deck winch that can be found out in this area in about 20 metres. Another way to dive Fly Point is instead of heading left (west) to the ledges, enter the water and follow the sand ridge around to the right. 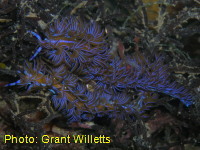 This is an excellent spot to find macro life including tiger pipefish. 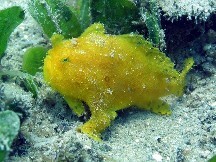 You can normally find a number of wobbegongs here too. 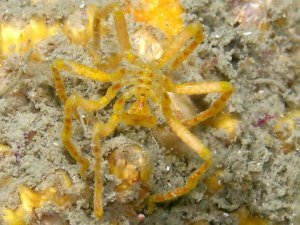 Fly Point is also an excellent night dive, at night the place just comes alive with critters that you didn't even know were present during your day time visits, such as rose bubble shells, decorator and spider crabs. WARNING! This dive must be done on a SLACK tide as the currents here are VERY STRONG! 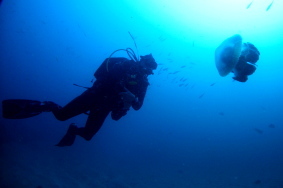 It is always recommended to dive here on the high slack tide as it produces the best visibility. It can also be dived on the low slack tide but the visibility is generally very poor. 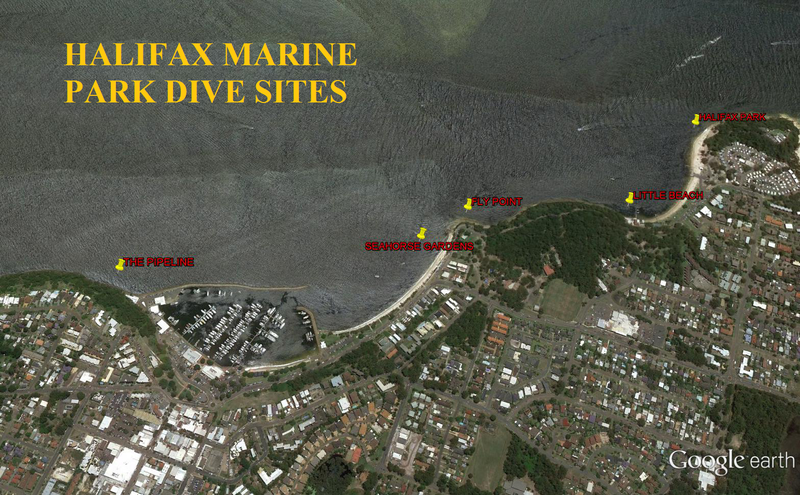 Fly Point is considered a very easy and safe dive site, hence it is a very popular training ground for Open Water courses and many dive shops come up from Sydney to teach here. It can get very crowded at times with dive courses, especially over summer and the Easter break. The pipeline is arguably the best macro dive in NSW. 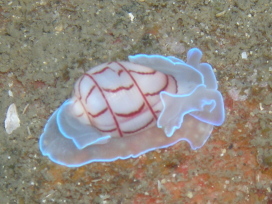 You can find many weird and unusual critters. The pipeline is tide affected so it always best to dive it on the slack high tide. Visibility is not always the greatest here, on average you would be looking at about 5 metres. The best visibility I have had at the pipeline would be about an outstanding 15 to 20m, the worst easily being less than a metre! The easiest way to dive this site is to follow the pipeline out to sea in a northerly direction. If you ever lose the pipeline, it's always easy to find your way back to shore or the break wall if you swim on a bearing of 330 degrees. Actually, a bearing of 330 degrees will get you back to shore on all the dives sites in Nelson Bay! Along the pipeline you'll find sponges, soft corals, seahorses, decorator crabs along the pipeline, other critters you will find are morays eels, eastern rock lobsters, tropical fish during the summer period, many different (and rare) nudibranchs species, cuttlefish, blue ring octopus, angler fish, sea pens, pipefish, bubble shells and on and on! There are so many different species to find at the pipeline, it will keep you busy for hours after the dive studying your marine books trying to identify everything you saw. 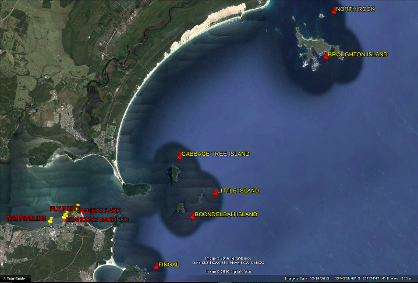 A suitable macro and diver training site dived at high tide south of the boat ramp between the two white posts which mark the swimming area. Playground equipment is located in six metres and an old houseboat is about twenty metres west of the southern post. From the houseboat a line leads further out to a barge and A frame which provide a haven for lots of small critters. 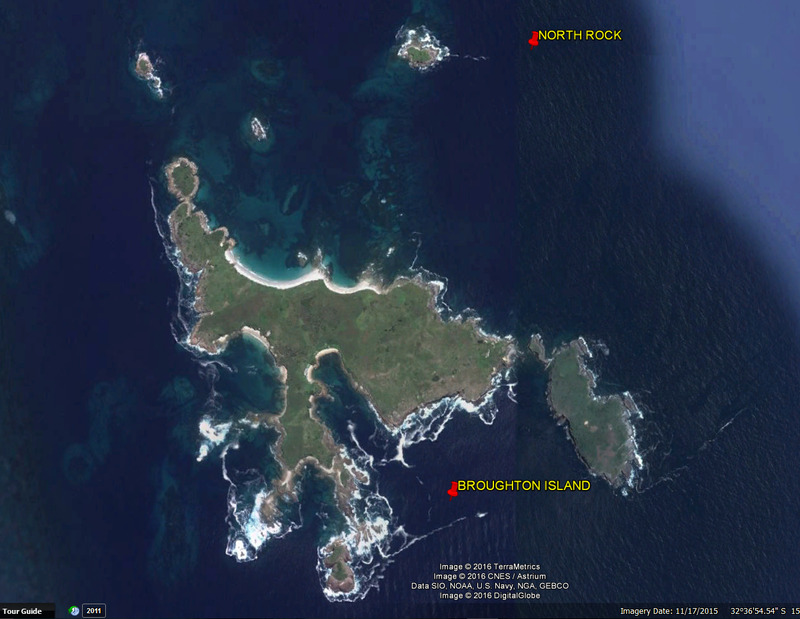 Twenty kilometres north of Port Stephens is beautiful Broughton Island. 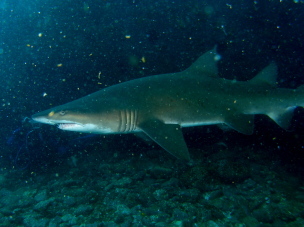 Diving is diverse, ranging from 40 metre walls to the 15 metre swim through at the Looking Glass, spider cave, bubble cave and the resident grey nurse shark family on the north side of the island. Map showing the location of the islands off Port Stephens. Click to enlarge. Only fifteen minutes from Nelson Bay, Fingal Island features pinnacles, drop offs and abundantly colourful sponge gardens. 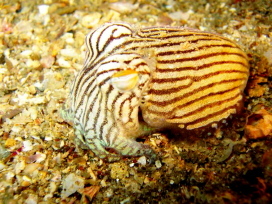 Fish and invertebrate life is extensive, ranging from tiny nudibranchs to schooling bait fish, morwong, friendly grouper and turtles. Fingal also has quite rocky bays diveable in almost all conditions and haven for breeding Port Jackson sharks in late winter and spring. The Pinnacle Plunging from five to 35 metres this is best in summer when yellowtail kingfish, cobia and mulloway move in to take advantage of schools of baitfish which come in with the warmer weather. Boondelbah offers protected waters with sheer walls, tight swim throughs and caves which provide a haven for bream, drummer and the inevitable blue groper. 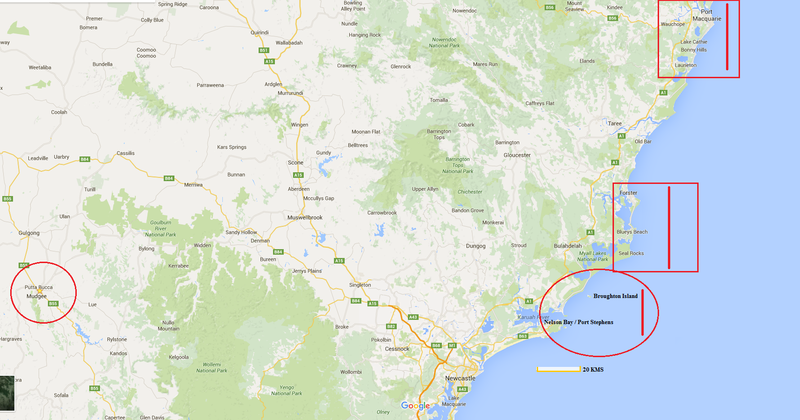 During summer you will also encounter large schools of mulloway and big snapper. 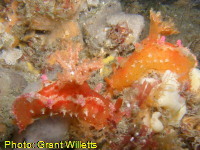 A colourful sponge garden on the south west corner drops away into deep water. While offshore winds during winter encourage us to dive the sheer walls on the eastern side of the island, Safety Bay on the southern end of the island is a perfect summer training location with total protection from the prevailing northeasterly winds. 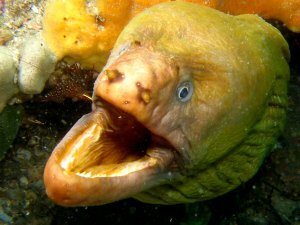 The most exposed dive sites in the area with sheer walls on all sides and attractive sponge gardens in the deep gutters to the north and east of the island. Our favourite site if you are into deeper diving. You can encounter anything out there, from cobia, snapper, small whalers and in summer schools of eagle rays. Port Jackson sharks breed close to the island and who knows what lurks out in the deep. A calm, and safe training location. Shallow rock walls drop off to sand in no more than twelve metres on the south western side making it a comfortable dive for the inexperienced and a safe location for diving when the strong northeasters blow during summer. A narrow channel through the middle of the island. Sheer walls covered with bait fish and small sponges, patrolled by large black rays and grey nurse sharks during the warmer months. A spectacular dive and even more exciting with a little surge. Sheer walls to a boulder bottom which slopes way down to 40 metres. Several small caves and overhangs feature colourful sponges. Good fish life including the rare (for the north coast) blue devil fish. A good alternative when the surge through the Looking Glass is too strong. 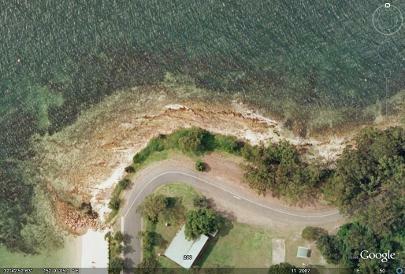 Narrow gutters on North Broughton are home to as many as 25 grey nurse sharks during summer. Mainly females and juveniles they were at first apparently nervous with divers but now appear to be more relaxed with small groups of intruders. Small, low cave in shallow water with two narrow entrances. 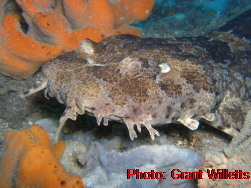 Home to wobbegong and Port Jackson sharks during breeding season and large wobbegongs later in spring when the travelling crayfish are also encountered. A large entrance funnels up to an air space well below sea level. An interesting non challenging cave dive. Large cod are encountered at the entrance as well as schools of baitfish. 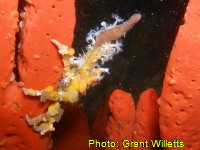 Kelp covered bommies, sheer walls and extensive sponge gardens to the east. Plenty of fish during summer and the occasional grey nurse. A pleasant alternative when the southerly's are blowing. An interesting dive for the fossicker, with gutters, crevices and a small cave at the eastern corner and a swim through lava tube. An easy swim except with a south east swell. 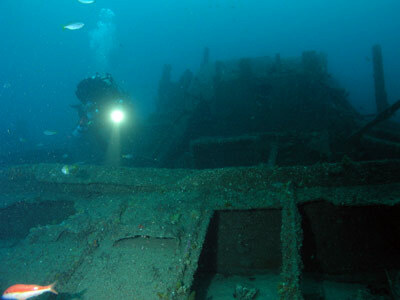 The Steamship Satara sank in 1910 and now lies in 45 metres of water just south of Seal Rocks. 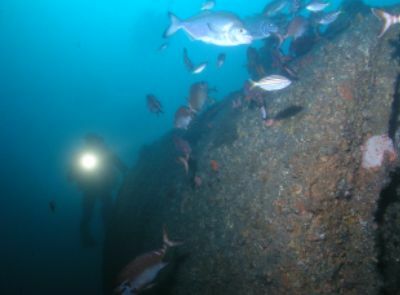 The wreck is approximately 125 metres long, 9 metres high and has a beam of about 15 metres. The boilers and the stern are the most interesting parts of the wreck and has an abundance of fish life including species such as snapper and morwongs. It is a deep dive with limited bottom time and is for experienced divers only. It is a long boat trip from Nelson Bay (2 hours) and charters can be arranged through Let's Go Adventures. A 154 feet long collier which sank with the loss of eleven lives in a terrible gale in May 1903. 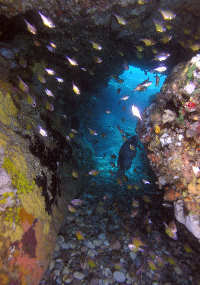 The wreck lies in 27 metres of water north of Cabbage Tree Island and is an interesting dive. 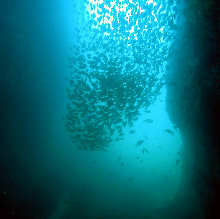 the wreck offers protection for huge schools of baitfish, bream, leather jacket. A similar vessel, the Macleay sank with the loss of fifteen lives after crashing onto rocks at Little Island in 1911. 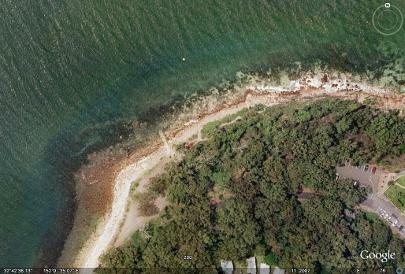 The Macleay lies in 42 metres off the south east corner of the island. 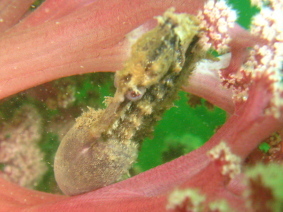 With often limited visibility, it is a more challenging dive than the Oakland. 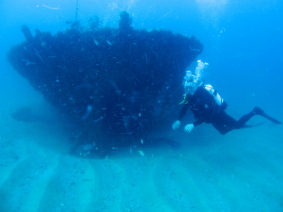 The engine and boiler are in good condition, while the partially collapsed bow offers protection for large mulloway while the rest of the wreck is covered by a large school of morwong.